With the exception of the last couple days, this has not been a good time to be a chicken. It seems we had snow cover and cold temperatures since Thanksgiving until the warm weather blew in from the south two days ago. 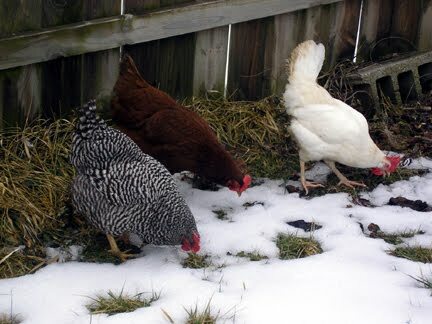 The chickens had been locked in their coops (five in one and six in the other) every day except for a few when the temps were close to the unfreezing point and bare patches began to appear under the bushes in Chickenland. On those days, we took mercy on the girls and let them out for a few hours in the afternoon. In a remarkable display of rare chicken common sense, some of them refused to come out until the weather got even warmer. Almost coincidental with the lousy weather has been the tenure of our latest addition to the Hervey/Lee menagerie, our Australian Cattle Dog pup, Suki. Our little Red Heeler is just turning 12 weeks. For the past two, she has been my frequent companion on trips to bring food and water out to the coops. I wanted to familiarize her with the chickens early on, so she will prefer to look after them, rather than make a meal out of them. This is working out quite well. She has earned their trust by not making runs at their fence and mutual curiosity has ruled the day. Remember, these are chickens that eat alongside a ground hog. So, being furry with sharp teeth is not automatic grounds for disqualification. The solstice, while heralding the arrival of winter, also signals the start of longer days. As if someone flipped a switch, egg production has gone from almost nada to about an egg-a-day. We have been the beneficiaries of green eggs the past two days, after having gone a month or two without any. We look forward to further improvement in egg production as the hours of daylight increase. The forecast is for colder days again, starting tomorrow. I hope to take advantage of a warm afternoon to clean out the coops. They are pretty foul - no pun intended – after weeks of constant occupation. Happy New Year from Chickenland!